Communications Biology recently celebrated its one-year anniversary. To celebrate, the editors have published a collection of their favorite papers from our first year. The Communications Biology first year anniversary collection features some of the editors’ favorite papers. The collection includes all of the journal’s review and commentary content and a small number of commissioned commentaries. Finally, the collection highlights the amazing “Behind the Paper” community posts written by our authors. Each editor used their own criteria to select from among the over 200 papers we published. This was no easy feat, considering that all of our published articles represent significant advances in their area of research. Our collection includes our most highly-cited and –read papers as well as those papers that captured the imaginations of our editors. One of our Chief Editor's personal favorites is this paper describing a mosquito that feeds on worm and leech blood, which was also the subject of this particularly vivid community post by Lawrence Reeves. 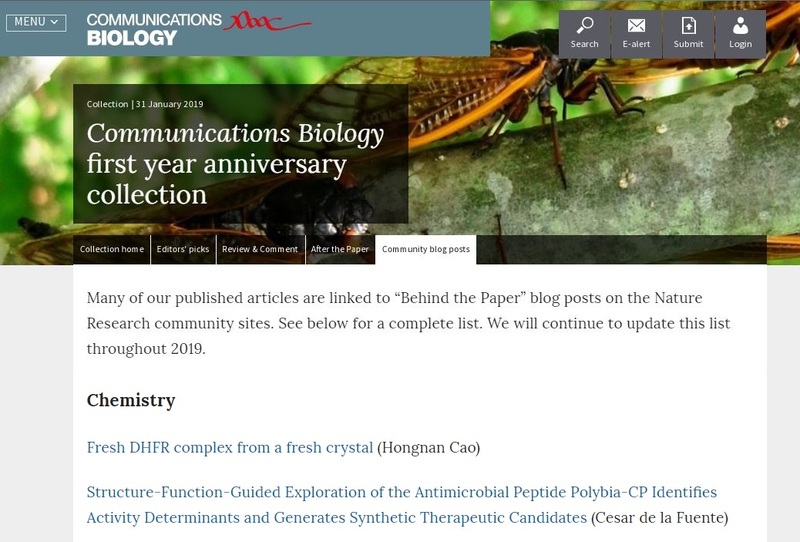 Our authors have contributed “Behind the Paper” posts to several of the Nature Research community sites: Microbiology, Ecology & Evolution, Bioengineering, and Chemistry. We invite you to browse the posts and our editors’ collection and be inspired by the diversity of research published at Communications Biology. Learn more about Communications Biology by visiting nature.com/commsbio and following us @CommsBio.